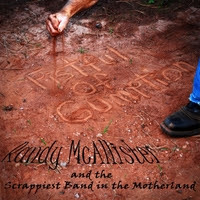 I just had the opportunity to review the most recent release, Fistful of Gumption, from Randy McAllister and the Scrappiest Band in the Motherland and it's flavorful. Opening with C'Mon Brothers and Sisters, a southern flavored soul track with a cool rock edge, features McAllister on vocal and drums backed by Rob Dewan on guitar, Maya Van Nuys on fiddle, Matt Higgins on bass and Andrea Wallace on backing vocals. Cool opener. On Time For The Sun To Rise, McAllister's vocals are warm and Dewan's guitar riffs have a magical Mali like sound. A nice violin solo by Van Nuys is really nice and Dewan's guitar soloing is fluid and inviting. Ride To Get Right has a real Cajun flavor with Van Nuys and McAllister (on drums) really putting on the steam. Roll With The Flow has a real nice revival like sound with warm backing vocals by Benita Arterberry-Burns and nice piano work by Carson Wagner. Aggressive rocker, My Stride showcases some real nice Rory Gallagher like slide work by Dewan and a tight melody making it one of my favorites on the release. Soulful, The Oppressor, it a really strong showcase for McAllister's vocals with breaks from traditional soul formatting to almost classical styling. Dewan really grips it on this one with intensity and Van Nuys' violin work is very nice. Masterful. Leave A few Wrong Notes has a great gospel rock feel bringing me back to early Leon Russell. This track just has great rhythm with solid vocals and standout piano work by Wagner and a great bottom by McAllister. On shuffle track, Band With The Beautiful Bus, McAllister and Wallace blend vocals particularly nicely and Dewan's country influenced riffs make this track another of my release favorites. Wrapping the release is blues rocker, East Texas Scrapper, with a lot of swagger, grinding guitar riffs light, flowing fiddle lines and flavorful harp work by McAllister. This is a really cool closer to a nicely constructed set.